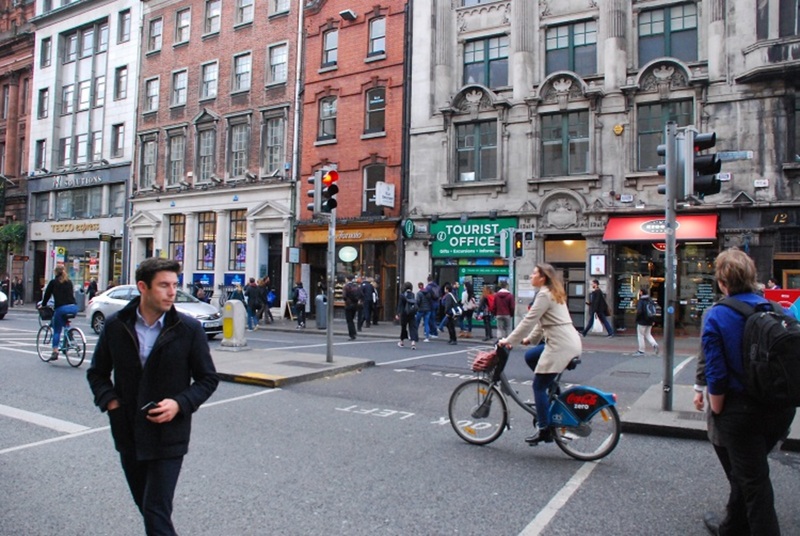 Last week, the Lord Mayor’s Forum on Moore Street put out a new vision for the historic Moore Street area, and the laneways that lie east towards O’Connell Street. At its centre is the development of a historic 1916 quarter as an alternative vision to the giant shopping mall planned by developers. 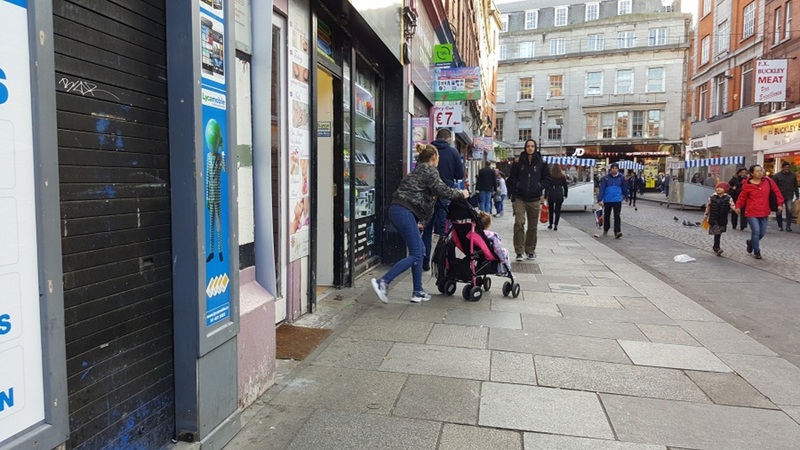 “It’s not a case of either dereliction or this shopping mall, there is a different way to proceed,” said Dublin City Councillor Micheál Mac Donncha of Sinn Fein, who has been involved in coming up with the vision. But while the vision takes in the views of TDs, councillors, architects, stall holders and the relatives of those who fought in 1916, some argue that there are voices missing. 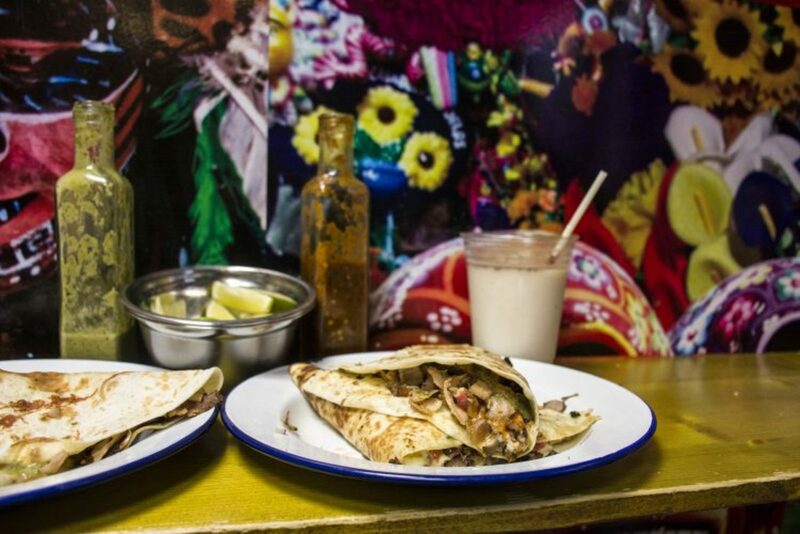 Where are the views of the small, mainly immigrant-run, businesses that dominate the street? The vision includes restoring as much as possible of the Moore Street battlefield site – which takes in the block and lanes east of the street towards O’Connell Street – to a state as close as possible to what it would have looked like in 1916 during the Easter Rising. That includes replicating period features, putting back in cobblestones, and getting rid of road markings and bins around Henry Place, Moore Lane and the Moore Street junction. The Bottling Plant and the O’Briens Mineral Water Works building would be restored to how they looked in 1916. 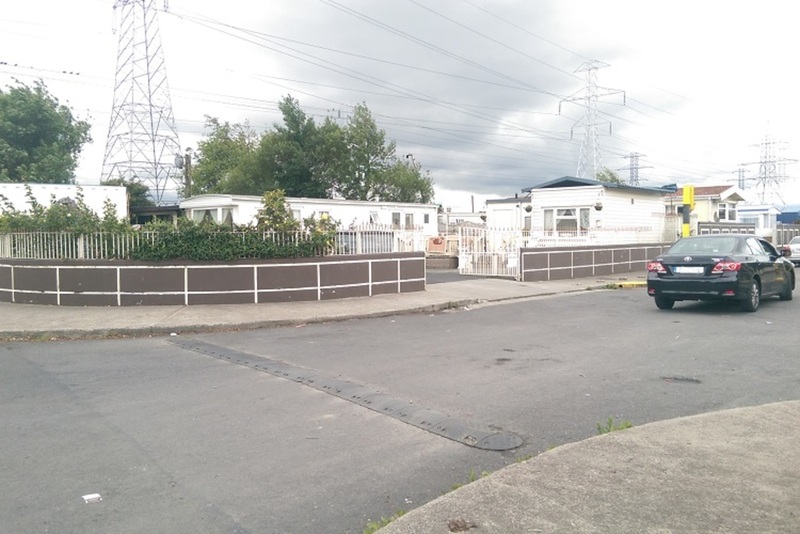 O’Rahilly Parade would get a similar makeover. Those who sat on the forum would like to see a long garden to the rear of numbers 10 to 25 Moore Street, which those who live in and visit the area could use as a place to relax and reflect. As for Moore Street itself, the vision suggests restoring it “to how it would have appeared in 1916 by replicating and restoring period features and removing modern distractions such as advertising hoardings, road markings”. The cultural importance of Dublin’s oldest food market would be recognised with long-awaited upgrades for the market traders: running water, electrical ports, and an indoor toilet. 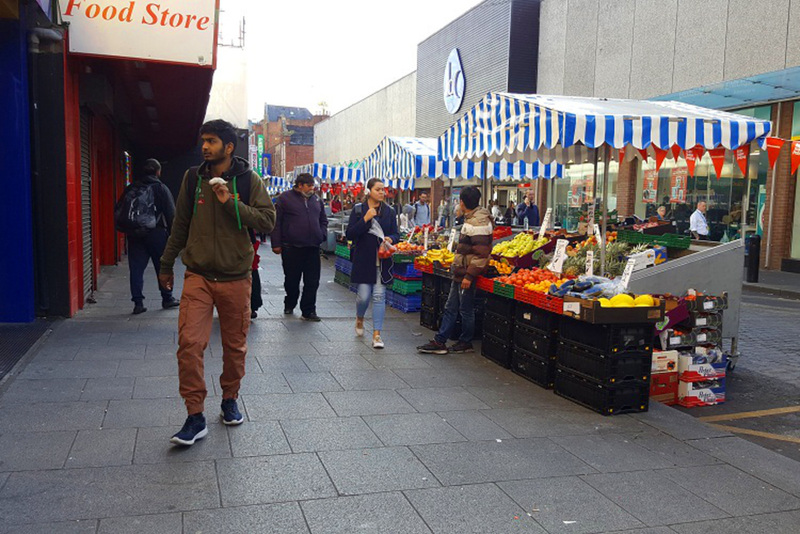 “This development of the street market aspect of Moore Street will be done in consultation with the current stall holders,” says the vision document. The Moore Street terrace of buildings – including numbers 10, 15, 16, 17 and 21 – would also be restored in line with the overall vision to emphasise the historic importance of the area. But while many welcome the need to preserve the heritage of a site that has been central to modern Irish history and independence, some have also questioned whether or not the vision could be broader in scope. In the latest round of discussions on the history and future of Moore Street, local businesses haven’t been consulted, says Godfrey Chimbganda, who advises some of the businesses on Moore Street. “I was quite annoyed about that. Not at all. You know the funny thing? The history of Moore Street is now more than about the uprising,” he said. As he sees it, it is also about the battle for street-traders’ rights led by local politicians such as the late independent TD Tony Gregory. “That’s an uprising in itself,” said Chimbganda. Green Party Councillor Ciaran Cuffe agrees. “[The plan] has a firm focus on the events of a hundred years ago and it talks about the street traders who’ve been there a long time but I have to say it could have done more to reach out to the more recent businesses that established themselves in the area,” he said. “Given that the population of the North Inner City, 40 percent weren’t born in Ireland, I think we should be doing a lot more to help those who’ve come to Ireland, set up businesses, and get ahead in the marketplace,” said Cuffe. On Tuesday late morning on Moore Street, Ming Huang was sat behind a small counter, pieces of mobile phones scattered in front of him. He is aware of the court case and the ongoing battle to save a long stretch of the Moore Street terrace as a national monument, and the planned giant shopping centre, from flyers that are dropped off, but hadn’t heard about any new alternative vision. He’s been there for two years but doesn’t see that there’s much he can do to shape what the neighbourhood looks like. “We have no choice, we just follow the government,” he said. There’s no intention to leave anybody out of the debate around the future of Moore Street, says Mac Donncha of Sinn Fein. “We welcome all the new communities and immigrant business people and so on, there’s absolutely no question of not trying to have everybody involved as much as possible,” he said. The historical restoration is an important part of the vision but he also wants Moore Street to be a vibrant commercial street, he said. Not all of the businesses are transient, though, and for those that are it is often not out of choice, says Chimbganda, the business adviser. For several years, there have been waves of businesses pushed out by sudden and frequent rent increases, he said. Where Dealz now is, there used to be a row of small businesses. “There were salons, African shops, some of the Indian shops,” he said. Many of the businesses are on three-month contracts, which leaves them wary about speaking out or trying to organise. But the council doesn’t have an easy go-to body for immigrant and small businesses at the moment to ask them to engage. “Basically, they can’t enquire because they are not allowed to organise. So, who is going to speak for them?” he says. In the Earth Angel Food Shop last week, Zafar Iqbal pointed behind him towards the aisles that stretch back stacked with yam flour and hair relaxant, past the stands of CDs and the fridges with bags of cow skin and snout. Iqbal has sold vegetables there for about seven years and he has ideas for what he’d like to see improved on the street, starting with tackling upper-storey vacancy. As Iqbal sees it, the buildings are neglected and the local economy is suffering because of it. “If we can renew everything. Everybody pays taxes, we pay taxes,” he said. Some time back, Chimbganda says there used to be a theatre down one of the laneways. “Those are the things I would actually love to get back on Moore Street. 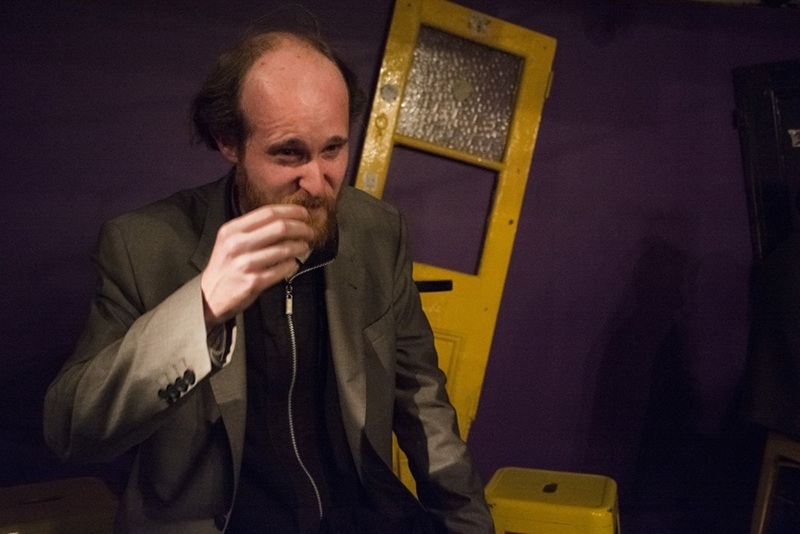 The theatre has been closed for a while,” he said. Gary Gannon, a Social Democrat councillor for the North Inner City, said that his experience of the forum for Moore Street was that it was all focused on 1916 commemorations, which was great to have included, but he would have liked to see it take a broader approach. “I think that’s all fine, but I’m interested in how we can really redevelop the street, develop some sort of economy, working with the traders that are already there,” said Gannon. “The way the traditional Irish traders and the new communities link in with each other, it’s a really nice environment,” said Gannon. Last Friday, Margaret Buckley – who has a fish stall with her sister, that her mother ran before her – seemed fatigued with the Moore Street saga and the piles of abandoned plans. “We’ve been listening to this for 17 years,” said Buckley. In that time, all kinds of things have been proposed and while she approves of plans to preserve heritage, she also says there needs to be movement on improvements for the living. Gannon says he understands that people on the Moore Street forum are really committed to protecting heritage. “That’s great, but it doesn’t talk about the city going forward, how we develop the city,” he said. “I would be interested in a forum about how we can redevelop Moore Street as kind of a marketplace,” he said. “There wasn’t an attempt to look at how to develop the trading economy, how can you protect the migrant businesses, how can you publicise it,” he says. Cuffe, of the Green Party, says he sees a role for the local enterprise office. Mac Donncha of Sinn Fein says the next step in the plan is to take the vision they have drawn up to the Moore Street Consultative Group, which has been set up by Fine Gael minister for Arts, Heritage and the Gaeltacht, Heather Humphreys. “It will carry weight and we will be expecting the government to act on it,” Mac Donncha said. The planning permission given to the giant shopping mall – which was extended by Dublin City Council a few months back – would push out those small businesses, he said. “The shopping mall can’t go ahead at least until that case is concluded in December 2017,” Mac Donncha said. Why do we need a shopping mall full of chainstores in the centre of Dublin city, for people to drive in, shop and drive away again? What good would this do for Dublin’s other shops? surely the immigrant business are there for the relatively lower rents because the street was due for demolition. Presently it’s just embarrassing seeing the guides take tours down around Moore Street in the current state it is, and especially the very dodgy lane ways. They knew 2016 was coming – there is no excuse. I’d imagine nothing will ever happen once 2017 kicks in. As with so many areas of Dublin, there is clearly a deliberate running down of an area until it suits developers to swoop in with more bland apartments etc., At the very least they could have had funded artists murals throughout the lane ways to give it a bit of color and history. Great to have a broader perspective offered re Moore street. It’d be great to see moore street more like camden markets in london. With its diverse ethnic population its amazing, we should prosper the ethnic culture here instead of making it harder for them for people who do things differently. We need to get some food stalls there and have some proper street food in our city instead of more overpriced restaurants and cafes (and shopping centres).